In historic surroundings, centrally located between the Queen palace on the Dam square and the famous Westerchurch (Jordaan). 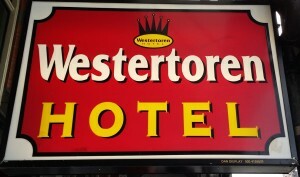 Hotel De Westertoren is ideally located in an historic building between 2 canals: the Herengracht and the Keizersgracht. Close to the Central Station of Amsterdam, with just a short walk into the centre of the city, with many of the famous Dutch attractions, we are easily accessible by car and public transport. The hotel is 1,5 km far from the central railways station. Trains depart from Schiphol airport regularly to Amsterdam Central Station, which is few minutes’ walk from our hotel (1,5 km far). Walk on Damrak street until you reach Dam Square, then turn right into Raadhuisstraat and you will find the hotel at the number 35 (on the left side of the street coming from Dam Square). From the Railway Station you can take trams 13 or 17 and stop at Westermarkt. Also trams 1, 5, 2, 25 stop at Dam Square and within 3 minutes you can be at the hotel. Leave ring road A10 at junction S105 and follow the centre.